A Filipino-Australian citizen sent a letter and we just want to share it to you. 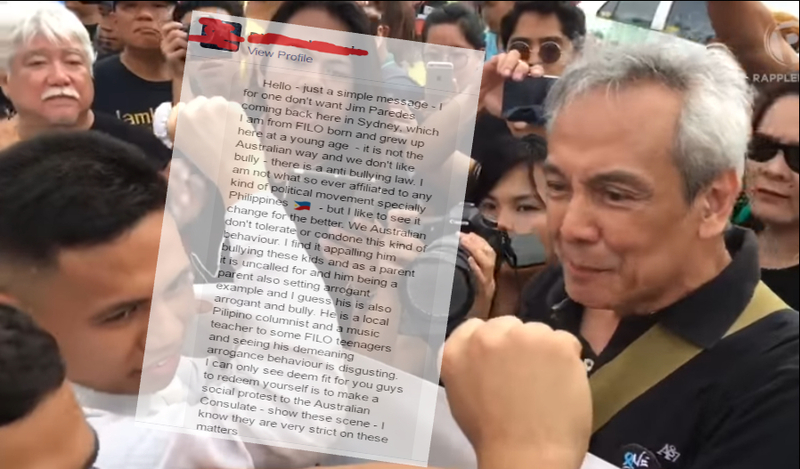 The letter is related to the incident happened in EDSA on February 25, 2017 where Jim Paredes berated the Duterte Youth Group. I for one don't want Jim Paredes coming back here in Sydney, which I am a FILO born and grew up here at a young age - it is not the Australian way and we don't like bully - there is an anti bullying law. I am not what so ever affiliated to any kind of political movement specially Philippines - but I like to see it change for the better. We Australian don't tolerate or condone this kind of behaviour. I find it appalling him bullying these kids and as a parent it is uncalled for and him being a parent also setting arrogant example and I guess his is also arrogant and bully. He is a local Filipino columnist and a music teacher to some FILO teenagers and seeing his demeaning arrogance behaviour is disgusting. I can only see deem fit for you guys to redeem yourself is to make a social protest to the Australian Consulate - show this scene - I know they are very strict on these matters. Make a point that he is there for holiday not for political reasons - which they reprimand him of his actions of deceit along those lines or he is a Australian citizen and making a radical political stance overseas which he sought an allegiance to the Australian constitution. Something like that angle - anyway you know better what to do. **Note: For security purposes, we masked the name of the person who sent us the note.